This was a very eventful summer to say the least, and I am working on 'clip notes version' post to explain myself fully. 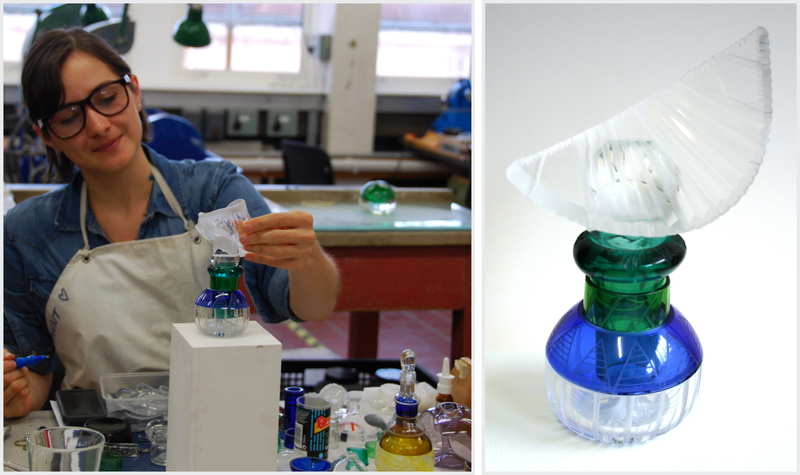 But for now, just wanted a quick note to mention that I am very excited to be one of the Artist In Residence at the Glass Department at ECA, alongside Anne Petters (mixing the hot shop with kiln casting/ Pâte de Verre), Andrea Walsh (cast glass with bone china) and Carrie Fertig (flame working mixed with performance)! The group is very diverse in techniques and expertise, so I can't wait to see what will come out of this experience. I feel very fortunate to have this opportunity to be an Artist in Residence. This is a scheme specially designed to support emerging artists and designers with the chance to access the studio free of charge, develop new skills and further their artistic career; acting as a stepping stone from student life to the real thing. In exchange, we assist staff members and support students in the development of their creative and studio practice. My plan for this one year residency, is to continue to evolve my studio practice by expanding the Mix&Match Series and explore new possibilities in the studio. Also I will be exhibiting my work, expanding my experience and exposure as an up-and-coming artist l designer. In the photo above, I am in the process of creating a new piece in the studio (mixing & matching though play) and on the left is the final non-functional vessel and it is called 'Abejón".